In the last of our opinion articles on Born Abroad, the BBC's unique immigration maps of Britain, a leading academic on refugees explains the role this key group is playing in modern Britain. When we look at the figures in the BBC's Born Abroad project, based on Census research for the Institute for Public Policy Research, how does the picture look for asylum seekers and refugees across the UK? Does it differ from arrival and settlement patterns for economic migrants and those with work permits, for family reunions or international students? And if so, in what ways is it different and why? It is important to answer these questions for a number of reasons. The experience of immigration and settlement is very different for migrants depending on whether their movement was compelled or chosen - and that experience is shaped in important ways by Government policies and strategies to 'manage' migration. Asylum seekers and refugees are compelled to leave their countries of origin because of political persecution, conflict and poverty which combine to remove safety, protection and opportunity. They experience trauma and psychological distress which fundamentally affects an individual's ability to take advantage of opportunities which exist in their new home. Over time there is clear evidence that refugees can rebuild their lives. Many indeed make invaluable contributions to UK society. However, refugees and asylum seekers face a huge challenge on arrival, and for some years after, that often compounds the trauma of uprooting and flight. Policies towards asylum seekers and refugees make it more difficult for 'forced migrants' to successfully adapt to life in the UK, than is generally the case for voluntary or economic migrants. Asylum-seekers are not permitted to undertake paid employment in the UK while their applications are being assessed. The statistics show asylum seekers as unemployed migrants dependent on benefits - but clearly this is not out of choice. In addition, in order to take advantage of opportunities that exist in the marketplace, mobility is vital: in normal life, people move to where they can find suitable work, rather than waiting to see if work comes to them. But since 2001, the UK Government has adopted a policy of 'dispersal' which was originally designed to address the dynamics so graphically portrayed in the Born Abroad maps - that of a concentration of recent immigrants in London and the South-East. Note: "Snapshot" figures of December 2004. The government had faced a lot of local political pressure to act - with some councils increasingly worried that they alone were dealing with a national issue. The dispersal system aimed to create temporary settlement of asylum seekers in places including Riverside in Liverpool, Hillfields in Coventry, and Sighthill in Glasgow. But while this took the pressure off London, the dispersal scheme was often poorly managed, and host communities and agencies were ill-prepared to cope with the influx of arrivals. In a number of UK cities this lead to tension and hostility between dispersed asylum seekers and local people, and resulted in the suspension of a number of schemes often on police advice. For those who were dispersed, the combination of restrictive policies, the trauma of becoming refugees and the tremendous uncertainties of the asylum process militated against 'migration success'. Earlier this year, ministers announced that, for the first time in this country, refugee status would be time-limited. Crucially, people given refugee status will in the future have to prove a second time round, some years after they have fled their own countries, that they still need protection. This five-year limit on refugee status, with the likelihood of return the country of origin, would appear contradictory to the Home Office's carefully prepared strategy to integrate refugees, a plan that has been years in the making and costly in terms of consultation and civil servants' time. The history of refugees in the UK shows that successful integration comes when individuals and their families feel they are settled and can plan a new home and livelihood. It is this kind of security, for instance, that helped the Asian families who fled Idi Amin's Uganda in 1972 to start again, and generally do so well, in London and Leicester. However, the hill that asylum seekers and refugees are obliged to climb in the UK is made steeper still by the lack of availability and poorly-targeted assistance. Dispersal schemes, at least in their initial phase, placed vulnerable asylum seekers in areas and among populations who were ill-prepared for their arrival. Community tensions arose particularly over issues of housing and state benefits in parts of cities where demand on such resources was fierce. Often groundless local stories about unequal treatment fed parts of the national media's preoccupation with asylum seekers as 'scroungers'. 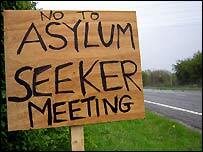 On the streets of the UK, asylum seekers became for many the preferred term of abuse as asylumophobia took hold; a category of immigrants came to represent peoples' anxieties and concerns about immigration more generally and the pace and rate of economic and cultural change. The Informational Centre about Asylum and Refugees (Icar) has for some time been mapping refugee settlement across the UK (see internet links). And what this shows is that refugees have for decades, and in some places for more than a century, been an integral part of the cultural, economic and social history of the UK - though this refugee history is often unacknowledged. Although the obstacles in the way of successful integration are many, even the most disadvantaged asylum populations are able to adapt and overcome those challenges. In 1998, no Somali students attained five or more GCSEs at grade C or above. In 2004, more than half were doing so. This turnaround has gone unreported amid the column inches devoted to immigration. But these children are a sure sign that with the right levels of support, fair media coverage and policies that help integration, asylum seekers and refugees will fit the model of successful migrants as readily as any other group intent on building a better life and contributing to their new societies. ICAR, the Information Centre about Asylum and Refugees, is an academic research and information organisation at Kings College, London. See internet links for more.